Jianwei Huang is a Professor and Director of the Network Communications and Economics Lab (ncel.ie.cuhk.edu.hk), in the Department of Information Engineering at the Chinese University of Hong Kong. He received Ph.D. from Northwestern University in 2005, and worked as a Postdoc Research Associate at Princeton University during 2005-2007. His main research interests are in the area of network economics and games, with applications in wireless communications, networking, and smart grid. He is a Fellow of IEEE, a Distinguished Lecturer of IEEE Communications Society, and a Thomson Reuters Highly Cited Researcher in Computer Science. Dr. Huang is the co-recipient of 8 Best Paper Awards, including IEEE Marconi Prize Paper Award in Wireless Communications in 2011, and Best (Student) Paper Awards from IEEE WiOpt 2015/2014/2013, IEEE SmartGridComm 2012, WiCON 2011, IEEE GLOBECOM 2010, and APCC 2009. He is also the co-recipient of Best Paper Award Finalist of IEEE INFCOM 2016 and GameNets 2011. He has co-authored six books, "Wireless Network Pricing," "Economics of Database-Assisted Spectrum Sharing," "Monotonic Optimization in Communication and Networking Systems," "Cognitive Mobile Virtual Network Operator Games," "Social Cognitive Radio Networks," and "Cooperative Traffic Off-Loading in Heterogeneous Cellular Networks." He received the CUHK Young Researcher Award in 2014 and IEEE ComSoc Asia-Pacific Outstanding Young Researcher Award in 2009. 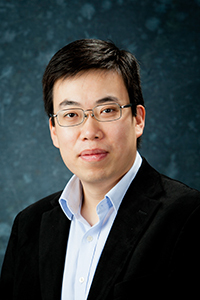 Dr. Huang has served as an Editor of IEEE Transactions on Network Science and Engineering (2017-), Editor of IEEE/ACM Transactions on Networking (2016-), Editor of IEEE Transactions on Cognitive Communications and Networking (2015-), Editor of IEEE Transactions on Wireless Communications (2010-2015), Editor of IEEE Journal on Selected Areas in Communications - Cognitive Radio Series (2011-2014), Editor and Associate Editor-in-Chief of IEEE Communications Society Technology News (2012-2014). He has served as a Guest Editor of IEEE Transactions on Smart Grid special issue on "Big Data Analytics for Grid Modernization" (2016), IEEE Network special issue on "Smart Data Pricing" (2016), IEEE Journal on Selected Areas in Communications special issues on "Game Theory for Networks" (2017), "Economics of Communication Networks and Systems" (2012), and "Game Theory in Communication Systems" (2008), and IEEE Communications Magazine feature topic on "Communications Network Economics" (2012). He also serves as a Series Editor of Wiley Information and Communication Technology Series (2017-), an Area Editor of Springer Encyclopedia of Wireless Networks (2017-), and a Section Editor for Springer Handbook of Cognitive Radio (2016-). Dr. Huang has served as Chair (2016-2018) and Vice Chair (2014-2016) of IEEE Communications Society Cognitive Network Technical Committee, Chair (2012-2014) and Vice Chair (2010-2012) of IEEE Communications Society Multimedia Communications Technical Committee, a Steering Committee Member of IEEE Transactions on Multimedia (2012-2014) and IEEE International Conference on Multimedia & Expo (2012-2014). He has served or will serve as the General/TPC/Symposium Co-Chairs of IEEE ICC 2020, IEEE WiOpt 2018/2017/2012, IEEE GLOBECOM 2017/2013/2010, IEEE SDP 2017/2016/2015, IEEE ICCC 2015/2012, NetGCoop 2014, IEEE SmartGridComm 2014, IWCMC 2010, and GameNets 2009. He is a frequent TPC member of leading networking conferences such as INFOCOM and MobiHoc. He is the recipient of IEEE ComSoc Multimedia Communications Technical Committee Distinguished Service Award in 2015 and IEEE GLOBECOM Outstanding Service Award in 2010.